The Grove City Higher Education Investment Program is designed to encourage students to remain Grove City residents after graduation. To qualify a student must prove residency within the City of Grove City’s corporation limit, attend a participating school and agree to perform 10 hours of qualified community service or agree to remain a Grove City resident for three years after the last scholarship award. The student must also maintain a C (2.0) average per semester. Full-time students receive a $1,000 tuition payment to the student’s participating school each semester (12+ credit hours) and part-time students receive a $500 tuition payment (6-11 credit hours). Each qualifying student can reapply each semester and receive a maximum of $12,000. Participating schools qualify by having a presence in Grove City and accredited by the North Central Accreditation Association aka “Higher Learning Commission” or offer a certificate or licensure track program recognized by a state regulatory authority. The participating schools include Columbus State Community College providing classes at the South-Western City Schools Career Academy, 4750 Big Run South Road (qualifying students may also attend Columbus State’s main, Delaware and regional campuses), Ohio Christian University at Grove City Church of the Nazarene, 4770 Hoover Road and Ohio Dominican University at the South-Western City Schools Career Academy, 4750 Big Run South Road. Funding of approved application is subject to City Council approval. 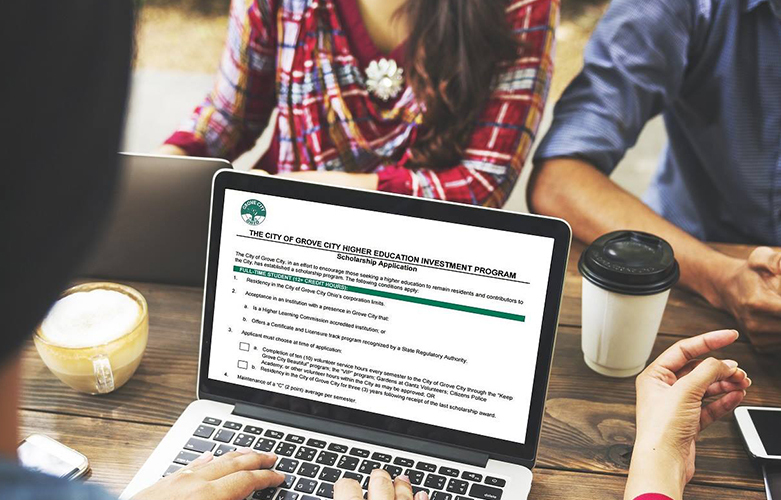 Download the Grove City Higher Education Investment Program application, affidavit of residency, promissory note and scholarship agreement. Applicant must submit the application, affidavit of residency, promissory note and scholarship agreement each semester funds are requested. After the first semester of funding, students applying for additional funds will need to also submit a transcript of courses completed for the semester. Submit completed application, affidavit and promissory note to Grove City Clerk of Council, 4035 Broadway, Grove City, Ohio 43123 by Monday, July 1, 2019. The annual application deadlines are July 1 for fall semester, November 1 for winter/spring semesters and April 1 for summer semester.